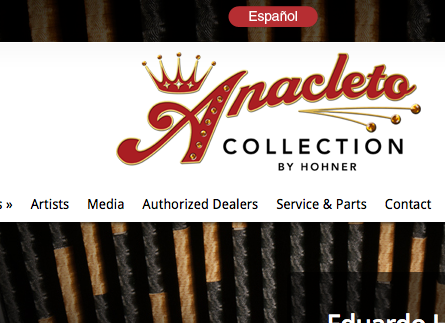 GLEN ALLEN, VA – Hohner, Inc. announces the launch of the Anacleto Series website at www.anacletoaccordions.com. The site showcases Hohner’s new line of hand-made premium accordions manufactured in the old-world style by master craftsman in Castelfidardo, Italy. Each accordion is designed with crystal patterns and color schemes to fit the artists taste and create stage presence. In order to meet the functional demands of different music styles, the Anacleto collection offers 3, 5, and 9 registers for different tonalities. Norteño, Conjunto, Tex-Mex, and Zydeco players will find Anacleto Series products designed specifically for their music genre. For those who demand even more versatility, the two-tone (two accordions in one) and 4-row diatonic models extend the note range. “The Anacleto Collection has the original fingerboard and smooth action that only one person knows how to make,” stated Juan Villarreal of Los Cachorros. “People always say ‘They used to make accordions this way in the past.’ The Anacleto Collection makes them that way, but even better.” commented Alfredo “El Zurdo” Gonzalez of Los Tucanes de Tijuana.